Were you born to own the road? Do you love spending your nights cruising the avenue, turning heads with the roar of your engine and stirring up a little trouble? Is your castle a towering high-rise and your kingdom the asphalt jungle below? Your domain is the urban streets of metropolis. It’s where you live, breath and drive. It takes a certain class of automotive accessories to accent your vehicle in just the right way – whether it’s your boss pickup truck or sleek crossover. ARIES offers a complete set of products to complement the urban street lifestyle, giving you a unique look for your ride and the functionality to back it up. ARIES AeroTread® running boards are essential to the urban crossover, featuring a sleek look to accentuate the curves of the vehicle. These running boards are constructed with an aluminum base to be lightweight and maintain excellent fuel economy, and they feature a stainless steel trim piece in two finish options. AeroTread® boards are also non-skid, featuring full-length step pads. To deck out the urban pickup truck and really make it stand out among its peers, the ARIES AdvantEDGE™ series offers the complete package. 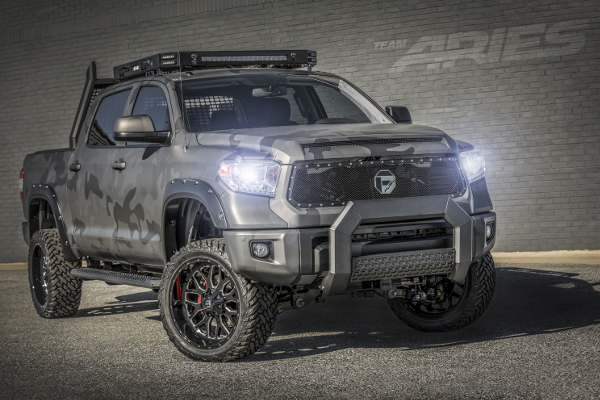 The AdvantEDGE™ bull bar, AdvantEDGE™ side bars and AdvantEDGE™ headache rack instantly transform a stock pickup truck, featuring a highly unique octagonal tube profile and powder-coated, all-aluminum construction. An excellent complement to the AdvantEDGE™ series is the Switchback® headache rack. This edgy, all-aluminum piece features integrated light mounts, a highly durable powder coat finish and a patent-pending stake pocket anchoring system for easy, secure installation. The Switchback® also allows the center section to be removed, providing convenient access to the rear window from the truck bed. 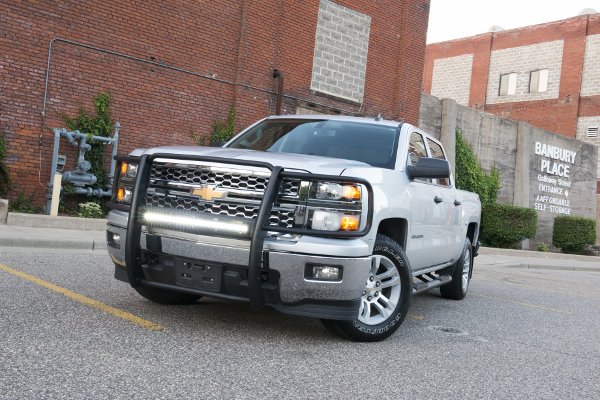 For some additional front-end protection and a unique lighting option, the ARIES Pro Series™ grille guard features a patented LED light bar housing. This light bar housing holds an ARIES 30” single-row light bar #1501264 and features an interchangeable cover plate for easy customization. The Pro Series™ grille guard is construction from high-strength, powder-coated steel, and each one offers a vehicle-specific fit with no drilling required. Additional light options for your street truck or SUV are available in our complete LED light bar and work light line up. ARIES LED lights are made with grade-A Cree LED chips for the highest quality, and they feature an IP68 and IP69K waterproof and dustproof rating. We offer everything from 2” square lights up to 50” double-row LED light bars. Our lights are also built to last, featuring a 50K-hour lifespan. For those looking to own the road with a lifted pickup truck or Jeep, ARIES offers the Big Horn™ bull bar and Big Step™ round side bars. Both of these complementary accessories features a bold, 4” diameter, round tube profile and is constructed from powder-coated aluminum to be strong, lightweight and completely rust-free. 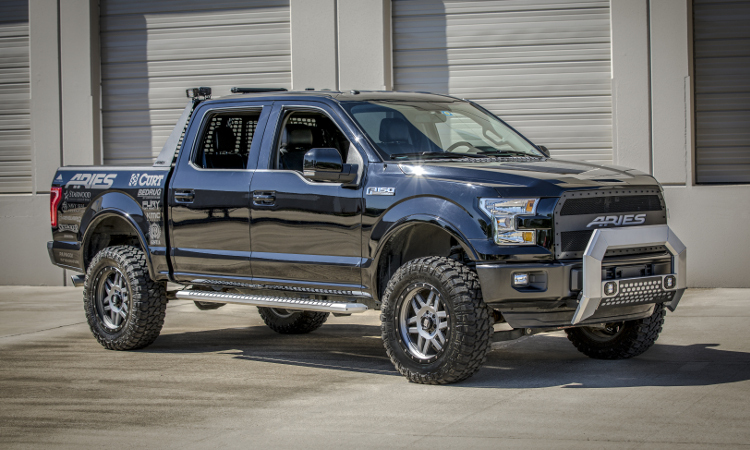 This bull bar and side bar combination is specifically designed for larger, lifted vehicle, showing off big attitude and adding some functionality.